Expect to hear a lot more about every tech company's 5G plans this year. Expect 2016 to be the year when all of the talk around 5G starts to feel like more than hype. It seemed as if the big tech companies couldn't shut up about it at Mobile World Congress this week -- and for good reason. It's been over six years since LTE 4G started rolling out, and a finalized 5G standard is expected to arrive around 2018. Now's the time to start exploring the new frontier if you've got a stake in mobile. Naturally, there were plenty of demos and jargon-filled press releases about 5G during the show. But there were also some impressive demos and a palpable excitement in the air for what's to come next. For the most part, the big advantage with 5G will be its flexibility, as carriers will be able to adapt it to suit specific needs. Things like smart home devices and connected cars, for example, might tap into a portion of the network that has slower data speeds but makes up for that with incredibly low latency of under a millisecond. 5G could also be used to deploy broadband more easily to rural areas using millimeter wave technology. The wireless internet provider Starry is using the same technology, and some people I've talked to in the industry consider it to be a sort of proto-5G network. 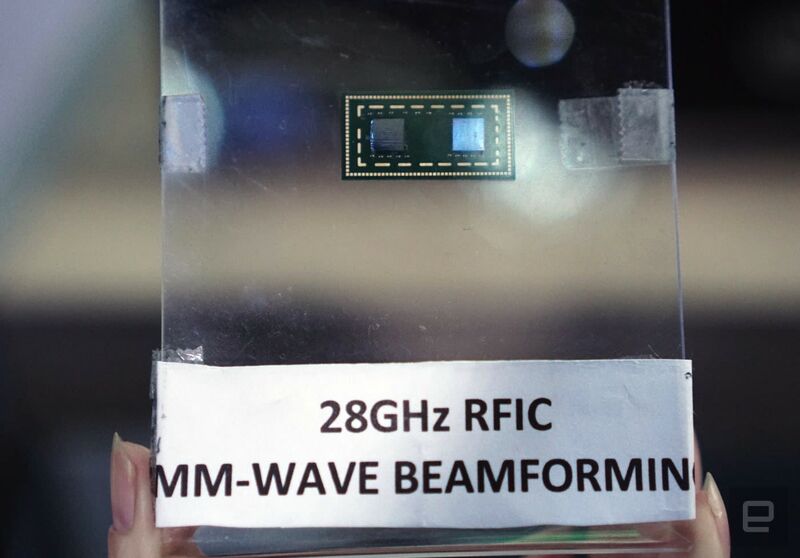 One of Intel's millimeter wave chips. None of this is exactly new, but at MWC there was far more commitment to 5G than ever before. Intel announced that it's lined up a bunch of new partners -- including AT&T, Verizon and Ericsson -- and it's also working closely with standards groups. The big takeaway: Intel will actually be working with the rest of the industry rather than trying to push its own technology (which would have been a repeat of the WiMax 4G fiasco). "I think companies like Intel and Samsung, they learned a lesson [with 4G's rollout] that ... doing something that doesn't have big ecosystem is not something that operators want," said Ozge Koymen, principal engineer at Qualcomm. "They want to be able to buy Nokia, Ericsson and other vendors and have them talk to different vendors." 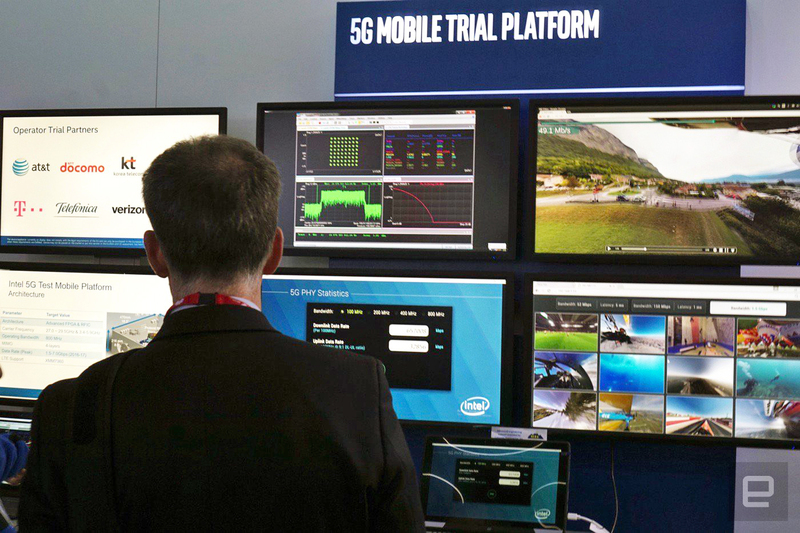 At its booth, Intel demoed several 360-degree videos running at once on its testbed 5G platform, using around 2 Gbps worth of bandwidth. There was also a "Massive MIMO" demo, an evolution of existing MIMO (multiple input, multiple output) networking tech, which lets up to 64 antennas push data to a single access point. That's what will keep 5G networks from feeling too congested -- you'll basically be guaranteed faster speeds. One longtime Intel engineer, who wouldn't go on record, said there was plenty more excitement at the company around the launch of 5G, compared with what it went through with 4G. Intel was't the only 5G star of the show (though it had one of the largest and most elaborate booths). Samsung and Deutsche Telekom built an elaborate setup with a robot arm to show off the benefits of low-latency 5G. You can see that in action in the video above, but basically the arm was only able to catch a falling ball that was tracked by a 5G network, while it continually missed another ball tracked by a higher-latency 4G LTE network. When will we actually see 5G networks rolling out? Based on discussions with people from several companies, nobody is expecting much until around 2020. While plenty of companies are testing out their wares now, they're still just prototype implementations. They can't really get into gear until 5G standards are settled, and that's not going to happen for at least another two years. 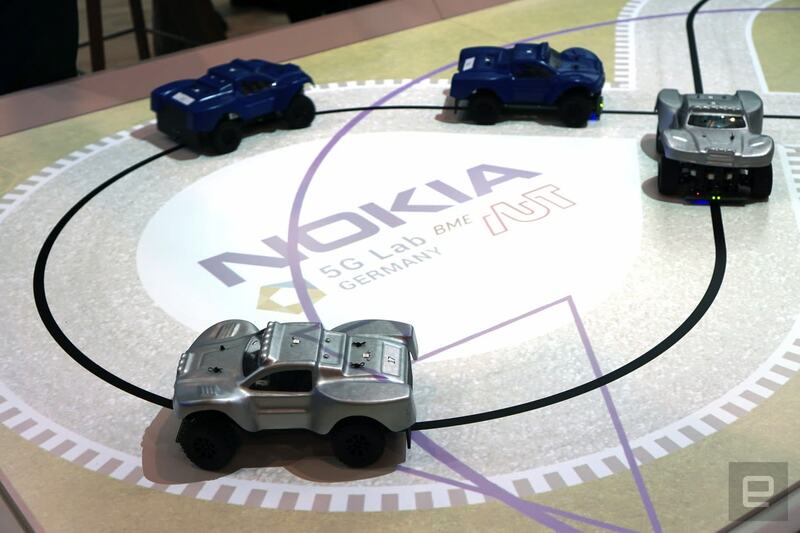 Nokia used autonomous toy cars to show off 5G. Even if 5G lives up to all the hype, it'll likely still be limited by wireless data caps. Which, basically, is like having a Ferrari that you can only drive around the block once a day. None of the carriers I talked to at the show had much to say about 5G plans, but Qualcomm's Koymen expects them to expand their data limits. Really, though, that's the least they could do. With 3G and 4G, carriers learned that it was simply very hard (and expensive) to offer unlimited data. But 5G might actually make that dream a reality.